Don’t worry about having to choose between the felt and the field. Americas Cardroom is combining poker and football by providing its players with a free NFL Super Bowl Bet. Players can earn up to a $100 Free Play by playing cash games between January 30th and February 5th. To participate, players simply need to opt in under the Rewards section of the Americas Cardroom (Rewards > Bonuses > Opt in NFL Bets) client during the promotional period. Once a player opts in, earning the Super Bowl Free Play is as easy as playing cash games. Americas Cardroom has put together four tiers for the Super Bowl Promo. Players advance through each tier by earning Awards Points. In Tier 1, players earn $5 in Free Play for every 55 Awards Points earned. There is a total of five $5 free plays. In the next three tiers, players earn $25 in Free Play for every 275 Awards Points. That can all add up to a total of $100. The Super Bowl gets underway on Sunday, February 5th at 6:30pm ET in Houston, Texas. Players have until 3:30pm ET that day to accumulate Awards Points and earn their Free Play. Upon earning the Free Play, players simply need to redeem it from the Rewards section and the money will be transferred to their sportsbook account. The sportsbook is accessible from the poker client via the Sports tab. 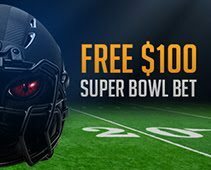 The Free Play isn’t the only big deal on Super Bowl Sunday as Americas Cardroom is hosting its $150,000 Sunday Special. The weekly tournament grew from $115,000 guaranteed to $150,000 when their brand new tournament schedule debuted earlier this month. Also recently launched is their Million Dollar Jackpots, and coming soon is the highly-anticipated Sit & Go 2.0 and Mobile app. Click here to read our review of Americas Cardroom.